Mori Ranmaru Nagasada, 1565-1582, (here Hori Ranmaru Nagayasu), a handsome heroic young man was a son of Mori Sanzaemon Yoshinari, who had greatly contributed to the prosperity of the Oda family. 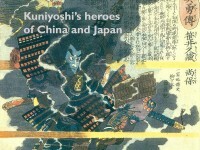 Although Nagayasu and his brothers all became pages of Oda Nobunaga, it was Nagayasu who was especially his favourite. When Akechi Mitsuhide angered Nobunaga during the welcoming party for Tokugawa leyasu at Azuchi castle (See No.11) [EA1971.103], Nobunaga, who was not satisfied by Mitsuhide's attitude of remorse, ordered Nagayasu to hit Mitsuhide on the head with his fan made of steel. this action tore Mistuhide's court cap and blood dripped across his forehead. Moreover, at that time, Mitsuhide owned a piece of land that had originated from Nagayasu's father, which forced him to swallow this further humiliation. At the Honnō-ji incident when Mitsuhide attacked Nobunaga, Nagayasu, just eighteen years old was killed. 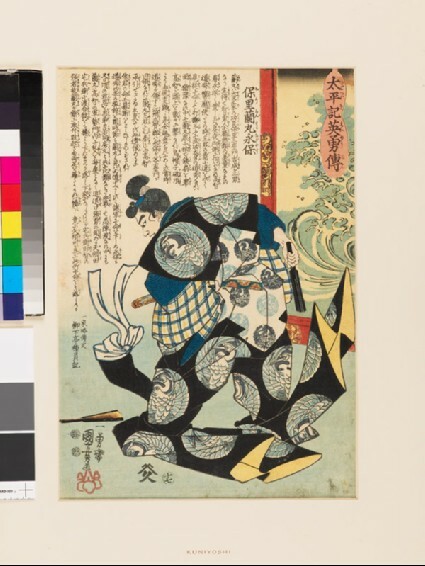 This print shows 'Hori Ranmaru Nagayasu' in court robes having just knocked off the court cap of 'Takechi Michihide' with his fan.